NEW YORK, NY—Spanning 92 acres on the lower west side of Manhattan, Battery Park City is a unique urban mix of commercial real estate, residential dwellings, retail stores, and public parks. The team can monitor up to 12 sites at once on NEC plasmas located at security headquarters. Battery Park City’s vulnerability to attack, and the inability of its security team to disseminate information effectively during the tragic attacks of 9/11, brought to light the need for a centralized security system that would be reliable in the event of an emergency. Battery Park City Authority, a New York State public benefit corporation, initiated a disaster management project to help keep Battery Park City secure. The vice president of safety and site management worked with Derive Technologies, an IT business solutions provider, to locate a company with extensive audiovisual and security system integration experience. IVCi was selected to design and install a customized AV solution. The vice president of safety and site management needed a system that would help his team see live action and identify where the impediments to movement are located in order to be able to allocate resources effectively, and divert people to a different route. He needed reliable, first hand information about the security status of multiple Battery Park City locations. 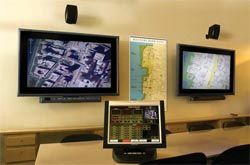 IVCi designed an audiovisual solution that would give his team the ability to monitor up to 12 sites at once on three NEC plasmas located at security headquarters. The feed from Battery Park City Authority’s cameras was connected via Internet Protocol (IP) to desktop and laptop computers so that each site on the network could be accessed from anywhere, simply by typing in an IP address. The control system was configured with IP remote capability; users who are on the network can remotely logon to the system via web-based eControl, and either view the feed from a personal computer, or on the three plasmas. Activity at the various sites can be viewed in real-time with a picture-inpicture layout. RGB Spectrum technology divides individual feeds into quad-view, with each quad showing one site, and the user can see up to four locations on one monitor. Video matrix switching is performed through an Extron CrossPoint that sends multiple signals to the RGB Spectrum, and this data is then processed into the quad-view. The layout can be controlled from security headquarters with a Smart Technologies plasma overlay, so that the user can simply touch the monitor and arrange it according to preference. Audio reinforcement for the room is provided by a four-channel power amplifier and four SoundTube wallmounted loudspeakers; video and audio can be routed to a particular display. Robust surge suppression is performed by SurgeX technology. The security system itself is complex, so the GUI control system that is used to interface with the technology had to be easy to use, especially in a crisis scenario. IVCi designed a customized, easy-to-use 15-inch wired Crestron touchpanel interface. Through it, the user can easily select the source, the route, and location. “We made the control system easy to use because we did not want the security team to have to battle the control system while they where battling a potential disaster,” said IVCi senior vice president of Audio Visual Integrated Services Tim Hennen. Nina Parker is the marketing director for IVCi (www.ivci.com), an audiovisual and videoconferencing integrator with headquarters located in Hauppauge, NY.